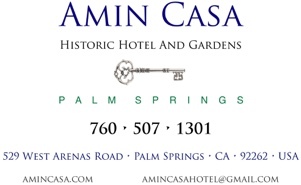 Amin Casa Palm Springs continues to create lifetime memories; therefore, we highly recommend you plan to reserve at least 8 to 12 months ahead of your scheduled event. To discuss your wedding plans, kindly follow the link below "Reserve Your Amin Casa Wedding" and provide us with basic details. Upon submission, we will respond promptly. If you wish, you may also call our hotel manager at 760-507-1301.